The trip from the UK to Australia when SS Asturias served as a 'migrant ship' took approximately 4 weeks. According to the "Instructions for the Voyage", passengers were allowed to take with them no more than £6 in UK currency, and up to £10 Sterling "in Australian or other currency notes .... making a combined total equal to £16 Sterling for use on board.... which may not be spent at ports abroad." The route from Southampton varied, with some voyages via Malta and the Suez Canal, Aden and Colombo and others via Karachi and Bombay to Fremantle, Western Australia, often picking up passengers. See the ship's voyage logs for ports visited. 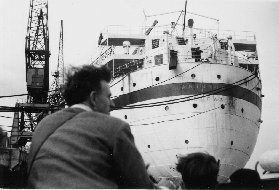 Many passengers disembarked at Fremantle to begin their new life in Australia, whilst others were then taken to eastern ports, including Melbourne and Sydney. *Source: Ten Pound Poms - Australia's Invisible Migrants by A James Hammerton and Alistair Thomson. More than one and a half million Britons left for Australia in the quarter century following the Second World War. The Asturias made 24 trips to Australia between 1946 and 1952, carrying more than 30,000 migrants. Most of them came under an assisted passage scheme through which adults travelled to Australia for just £10 whilst children travelled free*. Many children were brought to Australia as 'orphans' to find new homes.